In the early 1800s, the lifeblood of trade in the middle of the growing United States was the Mississippi River connecting northern and southern towns, bringing vital goods and travelers along the way. In this pre-industrial era, boats, because of their shape known as “flatboats” or “broadhorns”, carried these loads. Players, as merchants based in St. Louis, will be funding various expeditions down the mighty Mississippi, buying and selling cargo and moving passengers, with the goal of earning lots of gold. 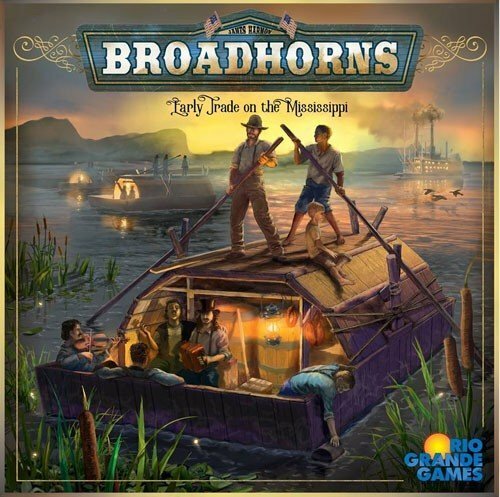 This is the world visited in the new design by Jim Harmon: Broadhorns: Early Trade on the Mississippi.